What a cool instrument. The viola organista. Leonardo Da Vinci had many talents and was given a large dose of creativity. One of his inventions was just created for the first time. A new instrument called a “viola organista” that is a cross between a piano, a violin, and listen for yourself. Interesting article from “the Age Entertainment” Nov. 18, 2013 Read more. Great resource for investigating Chinese and Western instruments. Those who are studying Chinese music and want to learn more about Chinese Instruments, such as this years IB Music grade 12 students, will find the Musical Instruments E-book site very useful. IB Music students are studying Xian’s “Yellow River” as one of their prescribed works for their final listening exam. One of the interesting features of this music is that it was originally composed for Chinese traditional instruments and then later rearranged for Western instruments. 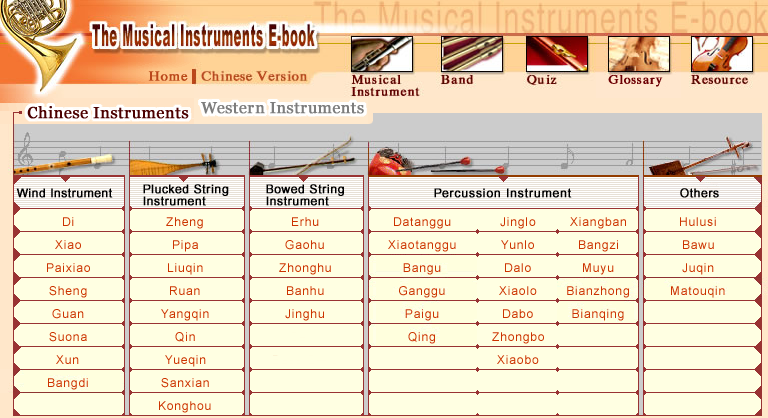 For those not familiar with the Chinese traditional instruments the Musical Instruments E-book is a great resource. It is also a good site for investigating Western instruments as well. Check it out and learn more. If you are ever in need of some drum equipment or drum lessons while in the Toronto area you might want to try Drumland in Toronto. They provide a large selection of drums and equipment along with private drum lessons for all ages. Check it out at Drumland. This post has nothing to do with music but I thought is was worthy of note. Adam Clark the student counselor at Yokohama International School is piloting a program on the benefits (if any) of using an ipad for his work with students. Adam has published some of his findings thus far on his blog Freedom Philosophy in an article “Two Essential Tools for Counseling”. He is quite happy with the product thus far and describes many of the benefits he sees in using the device. Check out the full article here.